Christina was born in Maryland, raised in Europe, and moved to the Islands in 1967. She currently lives and works in Honolulu, Hawaii. 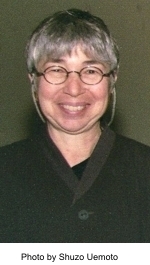 She received a Masters in Architecture degree and a Certificate in Historic Preservation from the University of Hawaii at Manoa in 1995 and was awarded The American Institute of Architects, Henry Adams Fund, AIA School Medal and Certificate of Merit for Excellence in the Study of Architecture. As is apparent in some Japanese design, Uebelein develops her themes using asymmetry, a stylization of natural forms, an accidental and deliberate treatment of the same element, a combination of abstract and naturalistic elements, an illusion of depth created by overlapping planes, and a repetition of elements to create texture. Click here to read an article on the Fiber Show (and a photo of Boho Bicycletta) written by Hawaii Public Radio's Noe Tanigawa.